Interpol's Daniel Kessler discusses their busy schedule, the acclaim their album has received and his plans for the future. Yes, today it is Interpol that occupies the Village in Dublin. Contrary to many of the doom-laden misconceptions of this quartet, as I am promptly introduced to Daniel Kessler and Sam Forenigo, they radiate friendliness and manners. The excitement that Interpol created as their album "Turn on the bright lights" picked up momentum has been quite spectacular. Along with the singles lifted 'Obstacle 1' and 'PDA' the result is evident today - a lot of journalists packed into the Village venue looking to speak to these guys and today Daniel Kessler is my victim. Sitting down sipping on a coffee, Daniel looks much smaller and younger than his counterparts and bears an uncanny resemblance to a young Noah Wyle. He waits patiently as I try to figure out my new digital Dictaphone. "That's the first time I've been interviewed with one of those," he says looking at me as I scrutinise the piece of equipment. "Now I know we must be getting big." This will be Interpol's second headline visit to Dublin since the release of "Turn on the bright lights", having played in Whelans already. "Yeah, it's kinda cool. I mean, where we played the last time was right next door and I remember this place. It's nice to have that sort of familiarity. We had a really great gig the last time and afterwards we hung out, y'know?" The show in Whelans took place as the album was still a fairly new release. Now, almost one year on, how does Daniel feel about what has been heralded as a stunning debut? "I don't know. I try not to think too much about it. I mean, we've just been so busy lately that you don't really get a chance to realise half of what is goin on. I mean, it's great that people want to get into it, but success, that's not what we've really been thinking about too much." Busy is certainly a word to describe Interpol's recent past. Constant gigs, touring the summer festivals and radio performance slots have graced their agenda. "Yeah, we played Reading Festival in England.. That was really good fun. The crowd had this chant going in between song like a football chant, y'know, 'Interpol, Interpol, Interpol'," Kessler sings as a smile of satisfaction creeps across his face. "We also did this performance for French Radio, basically the show is like their John Peel. But there was an audience there too. I mean, I didn't really know how to act, y'know? Like, do I perform cause there's an audience, or would I just look like weird cause it was a radio show?" The band was also nominated for the Shortlist Music Award in the USA. Their video for 'PDA' was also included in the nominees for the MTV2 Video of the Year award. "Yeah. Again, I think that's great, but it's not like that's what's on our mind all the time. When we hear about that type of things, we do go 'yeah, that's cool', but then we just go back to more important things. But I do think it is really important to be really involved in things like video and artwork or whatever. Anything that's creative and that comes from in here," he says patting his chest, "what represents you, us - Interpol, we want to make sure it's right." Interpol have already amassed a fan base and following as dedicated and devoted as that associated with your archetypal stadium band. "I mean, it's great y'know? I'll talk to anyone who wants to get into what we are doing. A lot of people who come to our shows do seem to be really into it, which is really cool. It's not like I've had anyone go a bit psycho on me! That, well, that could be a bit weird!" So no underwear thrown up on stage just yet? "Well, no, but, hey, I mean, that's great, yeah, they can do that if they want, ha ha!" On first impressions, Daniel may seems a little shy. He admits he was not particularly confident when he was younger and that, first and foremost, he really plays for himself. One area that he is not slow in coming forward on, however, is the absolute importance of Interpol to him. "When I was younger, this isn't what I thought I would be doing. It was just one day something inside was telling me I had to do it. I had all of these thing in here, inside, that I wanted to get out. Everything I feel like I need to say, I can do through Interpol. And we all share in the music. It's not like there is one person who dictates everything. Or that I would be like 'oh I wanna throw in this'", he says, doing an exaggerated 80s style guitar solo, "'in here! ', y'know? It's just whatever way it happens." So, as the news that Interpol will soon be heading back to the studio after a few more US dates filters through, does the obviously passionate Daniel have any plans for anything not related to Interpol in the future? "Hmmm, I dunno. 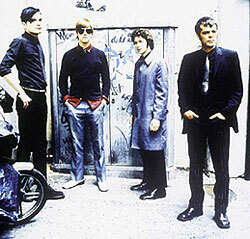 I mean, like, I say everything I feel I need to express, I'm happy to do it within Interpol. Hmmm� Maybe a movie score or something, like a whole movie soundtrack. But that's way in the future. That's just an idea. I don't have any plans at all." Daniel says reaching for his coffee. "I mean, right now, it's all about Interpol." And indeed it seems that presently that's what a lot of people are saying.